You are here: Home / Ed Tech / LMS & Learning Platforms / Blackboard Learn Ultra in 2018: Is it ready and does it matter? One of our longest-running series of posts is on the prospects and status of Blackboard’s Learn Ultra, the user experience redesign and move to the cloud of the world’s second-most-used (behind Moodle) and highest-revenue-producing academic LMS. It is fashionable to claim the LMS is dead or passé, yet this product category remains the centerpiece of educational technology at colleges, universities, and K-12 districts. To understand Learn Ultra is to understand much of the overall LMS market. 2012: Blackboard acquires Moodlerooms, and one benefit was the see of a cloud-based platform strategy. 2014: Blackboard prematurely announced Learn Ultra (new user experience) and Learn SaaS (move to the cloud). 2015: Learn Ultra is already a year late (more realistically, the BbWorld14 announcement was wildly unrealistic), but the University of Phoenix selects Learn Ultra as its next-generation learning platform. 2016: Blackboard switches CEOs, admits that Learn Ultra is still not ready, and struggles with a major messaging problem around the transition. 2017: No coverage - maybe we got tired of lack of not having customers to talk to. 2018: Blackboard makes Learn Ultra the core of its message at its users conference BbWorld18. What we have been asked multiple times, by institutions, by investors, by other ed tech companies: is Learn Ultra ready, and does it matter? The unsurprising answer to both questions is a qualified and somewhat confusing it depends. To describe a little further, Learn Ultra's Base Navigation is ready, but the Course View is not ready for meaningful adoption; furthermore, Learn Ultra is important to Blackboard’s future, but we think SaaS is more important to its present. To ask this question requires an understanding of terminology, as we first described in this post. Blackboard1 is pushing the metric that there are 61 or 62 Learn Ultra customers “in production” or "using Ultra", yet we have found very few that use, or even plan to use, Learn Ultra as their primary, institution-wide LMS. What gives? 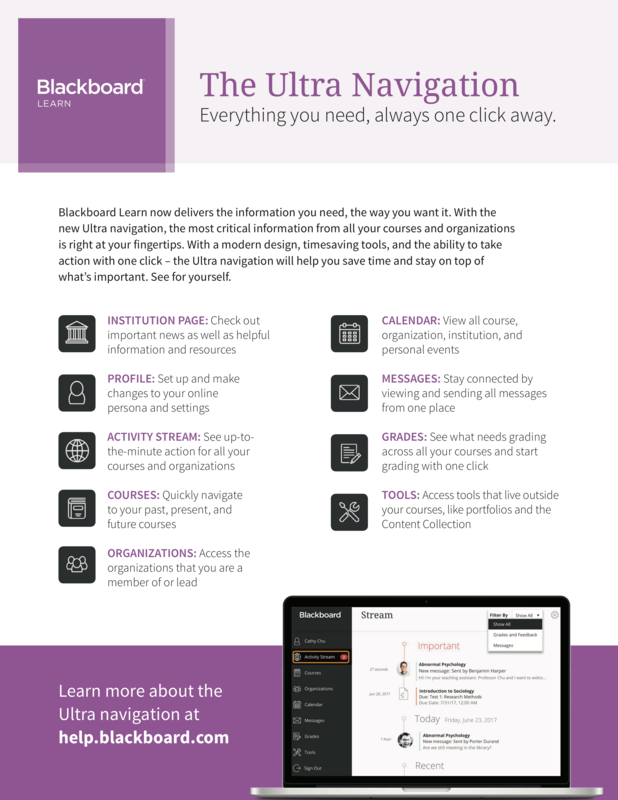 What became quite clear at this year's BbWorld 18 users conference is that when Blackboard says in production, what they mean is that the LMS administrator has enabled the Ultra navigation, which uses the new Ultra user experience framework as the landing page / dashboard with activity feed that users see before entering a specific course. The company calls this Base Navigation, but at this point every course can be configured to be in the Original Experience or the Ultra Experience. Thus, enabling the possibility of running a course in Ultra counts as in production (note that Blackboard now lists 91 clients on Ultra). Once a school has enabled Learn Ultra Base Navigation, they could choose to move exclusively to Ultra (e.g. the University of Phoenix, Northwest Florida State College, and a few others), or they could choose to keep all courses in Original (e.g. Northeastern State University), or they could choose to have some courses in Ultra and some in Original (used by the majority of schools investigating Ultra). 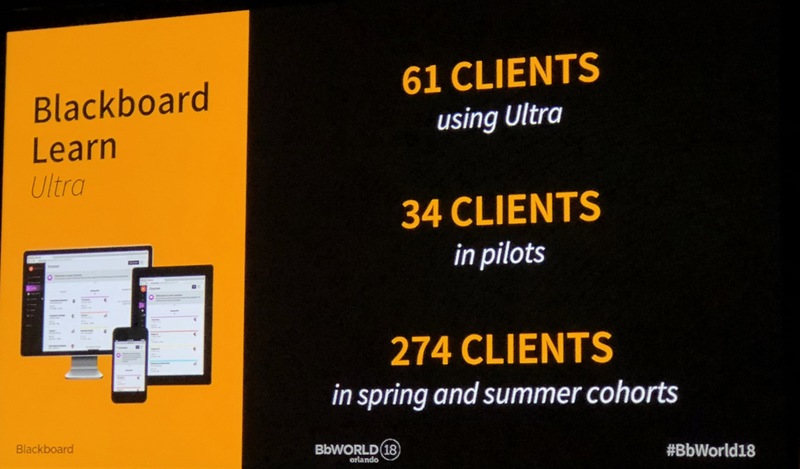 This last mode is known as Dual Course mode, and even Blackboard executives seemed surprised to find out that the vast majority of schools putting Ultra in production are in fact running in Dual Course. For many of these schools, there are no definitive plans to move exclusively to Ultra. Upon re-reading this description, I believe that I should give more credit than just describing a landing page and base navigation. The cross-course functionality is and has been a long-term goal of Ultra, as we described as early as 2016. Creating a brand for a set of design goals is inherently fraught. Let's look at two examples of how it makes communication of Blackboard's strategy tricky for them. First, there's mobile. Blackboard came out last year with a mobile app called Bb Student. It provides students with that activity stream view across courses and, of course, it's mobile-first. (In fact, it's mobile-only at the moment.) Furthermore, the company has made the product available for both traditional 9.x customers (which at this point is pretty much everybody) and their SaaS customers. People inside the company feel like they should be getting more credit for delivering on two major design goals (mobile first and stream-based activity views) as well as for delivering it to customers on the 9.x platform (which was more significant of a technical achievement than is immediately obvious). This is not a matter of Blackboard moving the goal posts, per se, and it is probably more accurate to say that Ultra cross-course functionality enabled by Base Navigation is ready and showing some benefits. The challenge is that this move is not sufficient to make a material change in Blackboard's company prospects. At best, Learn Ultra Base Navigation without usage of Course View will slightly slow down the rate of customers defecting for another LMS. For Learn Ultra to matter and to make Learn newly competitive, they need customers to also use Course View as the primary choice at their institution, and that usage by-and-large is not ready outside of a handful of schools.As an example from BbWorld18, Belmont University presented their experience moving to Learn SaaS (the important issue in the present, and a predecessor for adopting Ultra) and to "the Ultra Experience". But after we asked a question about faculty adoption of the Ultra Course Experience, the administrator clarified that there are no courses running Ultra - all they have done is enable the Ultra base navigation, and they do not expect to do any course migrations for at least another year. This full adoption of Learn Ultra might become important in the future, but it is not driving decisions today. Given that we’ve been asking for three entire years whether Learn Ultra is ready, one obvious follow-up question is whether it matters any longer. I do think the question matters as Blackboard is pinning their corporate turnaround on Learn Ultra as the core piece, and this message was heavily promoted at BbWorld 18. This messaging makes some sense in that we consider it unlikely that Blackboard can gain significant numbers of new clients (those moving from another LMS to Blackboard Learn, beyond a dozen or fewer schools) without Learn Ultra. Learn Original Experience has too much baggage and is too dated to compete with Canvas or Brightspace by D2L, at least in North America. The company's new Learn LMS clients are largely the University of Phoenix and ANGEL contract conversions. To be fair, the exceptions include several schools in North Dakota (migrating from Moodle) as well as Northwest Florida State College (migrating from D2L). But even with NW Florida State, they based their decision on Learn Ultra. Based on interviews with clients arranged by Blackboard, and based on our own connections at BbWorld, what we consistently heard during dozens of interviews and from listening to panel discussions was that Learn Ultra Course View makes sense primarily for programs or schools that have not been on Blackboard Learn before. Bb Learn clients seem to have too many expectations of needing the same functionality they had before, pushing Ultra to be largely feature-compatible with Original and thus losing some of its simplicity in the process. When the Illinois Institute of Technology migrated from Learn self-hosting to SaaS, which enabled them to explore Ultra, they chose one program and a handful of faculty that were willing to jump into Learn Ultra, but for almost all others they are sticking with the Original Course View for the time being. The soonest they would expect moving primarily to Learn Ultra at the Course View would bet 3-5 years from now. You can hear the same dynamic in a recent Rod's Pulse Podcast (shared under CC-BY-NC-SA license and also available at Inside Higher Ed), with Rod Murray interviewing Rob McCunney about their school (University of the Sciences) and its migration to SaaS and Ultra. It is a fascinating first-hand description of their experiences. Please note that they use use the terms Traditional and Original interchangeably. R Murray: We turned on the SaaS in January, but we really kept the Original Experience until July. In mid-July we flipped the switch to turn on the Ultra Experience. Now again for those of you are not as familiar with the way Blackboard works, that wasn't changing the course format. They were still traditional courses, but you know all those tabs and modules disappeared, and we ended up with a new base navigation in Blackboard, which they called the Ultra Experience. So that was a major change, and we do have some summer sessions, but we felt this was the least painful way to turn it on. We didn't want to wait till August just before our fall students came back. In terms of turning on the Ultra Experience, what were some of the major issues that you saw, that you were concerned with? R McCunney: Besides the fact that we lost the tabs and modules, so we kind of rolled out OneCampus as Rod said, I think one of the major things that that I noticed wasn't really even on the admin side, it was just getting people used to something that was completely different as soon as they logged in to that institution page. Where's my stuff, where is my modules? It just looks completely different than what they're used to, and there's some stuff missing, and we replaced it. We put stuff in other areas, and we communicated that, but that was probably the biggest hurdle. Just what is this, what is this Blackboard Ultra that you're changing me to? And at that point, in July we only changed basically the institution page. Your average user, once they get into their course they didn't notice anything different, but that initial freak out of here I don't know where my form is. We told them a dozen times where it is, but it's somewhere else. That was probably one of the major hurdles, and I didn't anticipate that as being a big as an issue as it was. I thought there was going to be more nuts and bolts issues, which there were very few of those for the most part. R Murray: Right now of course we don't have that many students here in the summer, so the real test will be in another week or so when students come back and really start. We all start kicking the tires, even on the traditional courses within the Ultra Experience. R Murray: The next big change that we have to live through has to do with converting courses to the Ultra course view. Now here at our university we certainly didn't do it en masse, we went to play with it for at least this term and maybe next. But there are some courses that we decided made a lot of sense to convert to the Ultra course view. Those schools that those courses that are brand new, especially online courses that are brand new, it made sense to develop them directly in the [Ultra] course view. Schools are trying out the Ultra Experience in terms of the landing page and cross-course functionality, but by-and-large they are very cautious jumping into the Ultra Course View where most of the functionality resides. Based on this situation, we believe that the migration to Learn SaaS might be a better indicator - at least in the short run - than Ultra adoption of whether a school plans to stick with Blackboard. When a school moves to Learn SaaS, they all tend to sign contract extensions for 1 - 3 years or at least internally plan no LMS migrations for more than 1 - 3 years. And the migration to Learn SaaS does not suffer from the vague terminology issues - a school either uses Learn deployed on SaaS (through AWS) or they don’t. 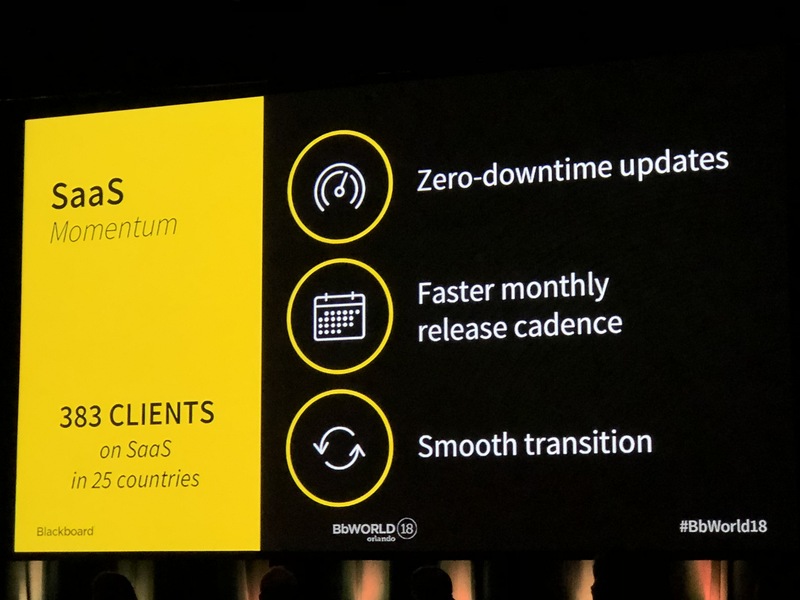 383 clients on Learn SaaS as of BbWorld 18 is good progress and easy to understand. This issue is what likely matters more to Blackboard clients today and for the next few years, but in the long run the company needs Learn Ultra to be accepted - including at the course level - in order to become more competitive and pick up new clients. In the end, Learn Ultra is partially ready and does matter, more so in the future, but the Learn SaaS migration matters much more today. This answer is a real improvement over the situation a year ago and even from the beginning of this year, but it is still a far cry from a simple yes and yes answer that Blackboard would like to have. Phil, thanks for the quote, but please correct the name of our Bb sysadmin, it’s Rob McCunney not Rob McKenna! Hey Phil, we feel this same “feature-parity” pressure between 9.1 and Ultra, which we have running in “dual mode” on our production SaaS server along with the new base navigation. We have about a dozen faculty running courses in it this Fall and hope to migrate the campus in Fall 19 (https://doit.umbc.edu/news/?id=78092). We’ll see. One way Blackboard has tried to help is through an Analytics for Learn (A4L) report called “courses ready for ultra.” Basically, it looks at the tools actually used in 9.1 by your school’s courses and then indicates if these will “work” in Ultra. Admittedly, you need A4L, and we had a few hiccups getting this delivered report to work in our instance, but in theory, it takes a bit of the guesswork out of deciding when to migrate based on the tools actually deployed by faculty and used by students. That said, a few years ago we looked at and started promoting a very powerful, but lightly used 9.1 tool called adaptive release, which is Bb’s basic “adaptive learning” function (https://doit.umbc.edu/itnm/practices/adaptive). Among other things, an instructor can daisy-chain release of content based on students’ grade on a prior assignment. For example, at the start of semester, faculty can assign a “syllabus quiz” that students must pass before they can access, let alone submit, any future assignments for credit. This gets students’ attention, and we’ve featured several particularly good use cases across multiple disciplines. But after promoting this for a while, I noticed something unusual: while few (115) of our 2,400 or so courses used it, the percentage of items accessed by students (86%) was far higher than the average for all other courses that did not use adaptive release (53%). Here’s a screen shot of our Spring 15 term from a recent presentation: https://screencast.com/t/m5iMHef7JBu. When we look at this report for other terms, we see similar patterns. John, for some reason WordPress thought you provided too much info and therefore were spamming (great logic there). Sorry for delay while I had to approve. R Murray: Again for those who are not familiar with the Ultra course view, when you go to convert an existing course, especially if it’s one that’s been used for several years and there’s a lot of content, and you decide to flip the switch to see what’s going look like on Ultra. There’s often a rude awakening, and it [conversion tool] gives you the opportunity to see what is broken. In fact, I think it categorizes the limitations – minor, medium, and then some serious limitations – what comes to mind and some of those limitations when you try to convert of course? R McCunney: Right. They do separate them out. I think it’s high, medium, and low. Just as I said, if there was a third-party tool that was linked via a Building Block, that’s going to break. That’s not going to be there. If you go 3 or 4 folders deep into a course, you can only do that 2 folders deep now, so if it will just bring it up a level. If I had Week 1 / Topic 1 / Topic 3 / Homework 4, and I converted, that would move all that up to the Topic 1 level. Some of that’s to be expected, just how to rearrange your course. No, Phill, the A4L reports I’m talking about aren’t the same as the 9.1 Bb course preview in Learn Ultra, though I agree with Rob McCunney that the three-level limit is going to take some faculty by surprise. From an accessibility and responsive mobile design perspective, though, I think Blackboard had to make these choices. Nobody wants infinite clicks to get to content. Maybe they’re still piloting with us, but these reports allow you to see which tools are actually used the most in 9.1 and whether or not they exist in Learn Ultra. This is more of an aggregate, summary data view of any school’s 9.1 instance and how it would fare in Ultra based on deployed tools by faculty. I’d also like it to show the percentage to tools and content actually used by students, like I mentioned about adaptive release above. In this way, we could see where most of our users are going to encounter issues. Based on our own surveys, workshops and informal advisory group, the biggest showstopper is the inability to upload a grade book that has been downloaded and perhaps modified (e.g., different/new column headings, etc.). Apparently, a lot of our faculty use that. But I’d like to do more than gather qualitative feedback. I’d like to inform our decision with data from the system itself, and I think the A4L Tool Adoption and Ultra Indicator reports are a step in the right direction. In helping us see which 9.1 courses are ready for Ultra, I think it will help us know if Ultra is ready for us. Unizin RFP For LMS: An offering to appease the procurement gods?